A friend asked me how we can preach to encourage listeners apart from making them feel guilty. He and I would both recognize the need for genuine conviction of sin, a work of the Spirit and a feature of some texts (and therefore some messages). But I understand the need for the question – too much preaching relies too much on guilt as the primary, or even the only, change mechanism. Guilt is a poor motivator. The Spirit of God certainly does bring conviction to people, to me. An absence of conviction of sin in a life is an indication of a real problem. But there is much more to the Spirit’s work than just conviction of sin. There is much more to life transformation than guilt. As I read the Bible I find myself convicted, yes, but also stirred, inspired, encouraged, enlightened, intrigued, reassured, enlivened, thrilled, calmed, galvanized, spurred, moved, attracted, delighted, renewed, transformed, changed. God uses the Bible to change lives, and He changes lives by more than just guilt. So how, as a preacher of God’s Word, can I beneficially engage the lives of listeners with more than just a guilt session? This week I’d like to offer several elements of an answer to this question. 1. The Preacher’s Stance. Where do we stand? Guilt-only approaches tend to take a domineering and confrontational stance. This comes through sometimes before a word is even spoken. It shows in demeanour, in expression, in attitude. It may be justified in terms of the authority of God’s Word, etc., but it is worth rethinking. I would suggest a stance that is empathetic rather than confrontational, although there is a place for the latter. I am not suggesting the preacher stands amongst the listeners as a sympathetic fellow-struggler with nothing more than shared struggle. We do stand with God’s Word and so do have something very profound to offer. But we also stand as recipients of that Word. Sometimes our talk of authority can lead us to authoritarian approaches. Yes, God’s Word has authority and as I preach God’s Word there is a “thus saith the Lord” aspect. But it is right here that some betray their narrow view of God and come right back to a guilt-only approach. That is, they see God as being purely authoritarian and a guilt-approach-only Deity. Thus saith the Lord. We represent Him. How did God reveal His own character, personality, values, etc.? On Sinai, through the prophets, in Christ? God didn’t just come as a pounding fist. We should consider the stance we take as one standing and speaking God’s Word, while at the same time being one standing as a recipient of God’s Word. If our stance is simply a “lording it over” stance then we betray a worldly passion for power that reflects a twisted view of God Himself. Tomorrow I’ll add another element to consider in pursuing how to preach with more than just guilt. In my opinion, conviction is not the same as guilt. Conviction by the Holy Spirit leads to repentance/appropriate action/transformation. Guilt usually leads to depression/despair. I’m not a preacher but when I share God’s Word or share the Gospel with others, my approach is to speak the truth in love with grace and gentleness. It’s the Holy Spirit’s job to convict people, not my job :). I agree entirely. I overlap the terms only to recognize that there is a place for appropriate feelings of guilt in light of conviction. When there is sin, there should be guilt. But godly conviction should lead to the changes you describe (unless the person hardens their heart). Guilt trips tend to lead to depression/despair, or to independent effort as I’ll mention tomorrow. I think you are right, that sin should not be the main point of preaching. It always saddens me when I do crosswords and come across the clue “subject of a sermon” and the answer is always “sin”. God dealt with sin (amen!) but not as an end in itself, rather it was something He had to get out of the way before He could get to what He really wanted, which is Life. The cross is a doorway, and so we need to preach it to those outside, but too often it seems as if the goal is to get people TO the door, not THROUGH it. We need to attract people by what is available on the other side of the door, and then point out that you can only get in by going through the door. I think we do well to recognise in this discussion that “guilt” (as used Biblically) is not a feeling, but a legal fact. That legal fact (that we’ve wronged God and so are out of fellowship with Him) is not something we should ever minimise. We tend to use “guilt” to refer to a bad feeling that we have about the things we have done. The Bible does talk about that bad feeling (2 Cor. 2 & 7, Lamentations 3:32-33, perhaps Psalm 32), but it isn’t a major focus of Scripture, and as Paul says in 2 Cor 7, feeling sorry only has value if it brings repentance. 2 Cor 2 says too much sorrow over sin is a bad thing — you have to accept God’s forgiveness and rejoice in it, and move forward. Obviously, then, if our preaching stirs that “sorry” feeling, there is Biblical precedent for that — but we need to preach it then with the heart that we see in those passages in Corinthians and Lamentations. Most “guilt preaching” is simply emotional manipulation so the preacher can have the satisfaction of seeing people respond to his “great” sermon. Recently my wife and I were dealing with a situation where there was sin involved. One person involved felt offended that they, well, felt, in response to what had been said. I think my wife was spot on when she pointed out that when there is sin, the person should feel bad about it. It is our culture that says nobody should ever hurt anybody’s feelings. Certainly that feeling wasn’t enough, but like you suggest, it should drive the person to repent, to turn to God. These are great issues to ponder, thanks Jon. Hi, Peter. Used Biblically, guilt is a legal fact, not a feeling. We use the word to describe both. The “sorry feeling” of II Corinthians is what we today call “feeling guilty” — but perhaps we should try to get back to a more Biblical usage of the word “guilt”, because blurring the lines between the feeling and the legal condition is dangerous. I think we differ on 2 Cor 2 slightly. It appears to me the person in question has repented, and that the sorrow he is now feeling has become a problem, one of Satan’s devices to swallow him up (WARNING: crossreference coming 🙂 — Satan is the accuser of the brethren). He needs the church to restore him, in part to protect him from those feelings. They don’t belong anymore, it is time to glory in forgiveness. He is forgiven, and has no guilt (legal fact), so the sorry feelings should be put aside. Thanks Jon. 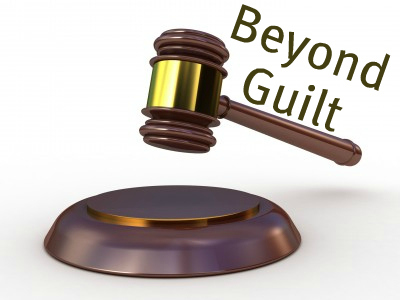 Legal guilt and feeling guilty are not the same thing, but I think there are also dangers in separating and dismissing aspects of feeling from such discussions. The idea of putting aside feelings conveys the idea that feelings are subject to the will – a notion I wouldn’t encourage in a counseling setting, or in parenting, or in marriage, etc. Well, perhaps “putting aside” isn’t the best wording. Some feelings do need to be rejected. If I’m angry because someone hurt my pride, I need to reject both the pride and the angry feeling — it has no place. If I’m feeling false “guilt” over something which is forgiven, I need to recognise it as Satan’s lie denying God’s gracious forgiveness and reject it. I’m not sure if that is “putting aside,” but we do need to recognise that some feelings in certain contexts have no basis in truth and righteousness, and reject them. Sin has impacted our emotions just as much as it has impacted the rest of us, and we need to put the sin nature to death in this area as well as others. I’m not talking about pretending the feelings aren’t there, but of recognising when they shouldn’t be there and rejecting them. I see guilt as analogous to physical pain. It’s useful, and even necessary, to let us know when something is wrong. It alerts us to danger and injury so that we can stop the harmful activities that cause the feelings. But like pain, guilt can only be a motivation for change when it is applied constantly and in increasing amounts. Using guilt as a motivational tool it the equivalent of holding a person’s hand close enough to a fire that it hurts, but not so close that it burns them. It’s dangerous, ineffective and unsustainable. More of my thoughts on this topic here.